Below is the allergen and shelf life information for all our products, which can also be downloaded. If you need any further information please do contact us. Y = contains; M = May contain; N = doesn't contain. *Our oats are tested at a UKAS accredited lab and certified to be less than 10ppm gluten. ***We follow the Vegan Society guidance on the declaration of allergens and the vegan status of our products. ****All products are produced in a bakery that handles egg, milk, peanuts, nuts (almonds, hazelnut, pecans, pistachios, cashews), and ingredients containing soya and and ingredients containing sulphites. ***** In November 2017 we launched a new cake baked with roasted peanuts. We have therefore introduced peanuts into our production areas. As with other allergens that we already handle, every care is taken to ensure that contamination of peanut free products does not take place, however, peanuts will still be used on the same line as peanut free products and therefore we cannot guarantee that no contamination will occur. Due to this, our advisory allergen statement going forward is “may contain nuts and traces of peanut”. 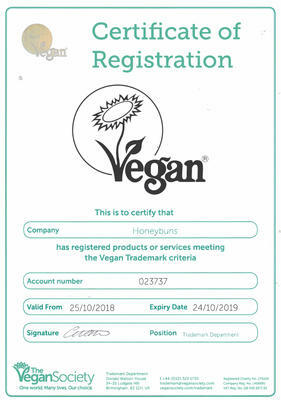 Here at Honeybuns we operate to very strict allergen control procedures, full details of which we are happy to provide upon request. We have amended the above allergen table to reflect this. None of our products contain the following: crustaceans, fish, molluscs, lupin flour or seeds, celery, mustard, sesame seeds or any derivatives thereof. The caramel in the Chocolate Caramel Shortbread and honeycomb pieces on our Cinder Toffee Brownie traybake contain RSPO certified sustainable palm oil. Q: Are you Approved by the vegan society? A: All our vegan cakes are all registered with the Vegan Society. The Vegan Society licence enables us to display their logo on our vegan products. This is a voluntary decision for individual food companies to make. We feel it will reassure vegans at a glance that they can enjoy our products. Here is more information about the Vegan Society criteria. Q: On some of your vegan cakes and traybakes, it states it is vegan on the labelling but there “may be traces of dairy”. Can you please advise? A: These cakes and traybakes have no added dairy in them. Our chocolate supplier states there is a possibility of traces of dairy owing to the fact they handle dairy chocolate in the same factory. As milk is an allergen we need to state this on the packaging. Having possible traces of dairy does not preclude a product from being vegan, please see the Vegan Society guidance. These are therefore not suitable for dairy allergy sufferers. Q: What vegan products do you make? A: Please see the table above for details of which of our cakes are vegan. We have plans to extend this range. We also make bespoke vegan traybakes for trade. Q: How can I buy them? A: Either directly from Honeybuns from our online shop. Some are available in John Lewis and Waitrose. The Bidfood and Brakes traybakes are available from cafes and restaurants throughout the UK. Q: Are your vegan products healthy? A: We make lovely indulgent treats using no nonsense store cupboard ingredients. They also happen to be vegan, gluten free and most of them are dairy free (some may contain traces of milk). They are still cakes rather than health bars though.